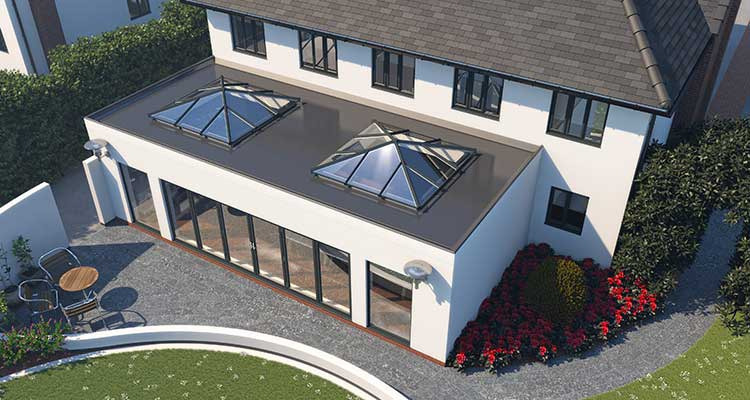 The innovative new Skypod skylight from Eurocell continues to forge ahead on the back of strong sales, with the addition of two new range options. Skypod SQ is a true equal four-sided design featuring just four hip rafters, which offers great balanced aesthetics and more natural light. The new options also means that larger perfect square lantern roofs feature jack rafter bars that line up exactly – which is an improvement on the original Skypod. Skypod features a unique spider casting and top and bottom caps for a robust, neater, professional finish. Like other Skypod variants, Skypod SQ offers a fixed pitch of 20 degrees and is supplied with self-cleaning, temperature-controlled glass, available in five colours as standard. The glass achieves a centre pane U-value of 1.0Wm²K, which means homeowners don’t have to put up with higher heating bills as a compromise for maximising natural light in their home. Skypod and Skypod SQ is available in kits from all 135-plus Eurocell branches nationwide and as individual bar length components and kits for Eurocell roof fabricators. Complementing SQ is the option to specify Skypod without any side rafter bars. This offers a much sleeker, more contemporary appearance, with a larger uninterrupted glass area made possible. Achievable using the standard system, no-side bars are expected to be popular with homeowners seeking maximum natural light and minimalist aesthetics. Other recent additions to the Skypod range include a two-bar pitched gable end design that eliminates the need for a central spider glazing bar, further improving aesthetics and increasing natural light. The new design joins the existing three-bar version in the range.